Lenovo has used MWC 2016 to unwrap a pair of new convertible laptops and a fresh tablet with detachable keyboard. We'll start at the top with the Yoga 710 convertible notebook, a mid-range offering that will start at €799 (around £625, or $499 over in the States) for the 11-inch version and €899 (around £705, or $799 in the US) for the larger 14-inch model, due out in May. The larger 710 will run with a Skylake Core i7 CPU and up to a 256GB SSD with Nvidia 940M graphics, which should allow for modest gaming-on-the go with the resolution dialled down. There's a new hinge antenna which Lenovo claims gives it a 20% stronger Wi-Fi connection than on its Yoga 700. As for the smaller model, that will carry up to a Core m5 processor. Both of these will boast a 1920 x 1080 resolution display and offer up to 8 hours of battery life, with Windows 10 as the OS, of course. You get Dolby Audio Premium on board for some nifty sound, too. The Yoga 710 weighs only just over a kilo (four grams over) and can change between four different modes: the usual laptop mode, tent mode, stand and tablet mode. Turning to the Yoga 510 (pictured above), this is a convertible notebook in the same style as the 710, although this time it comes in 15-inch and 14-inch variants. 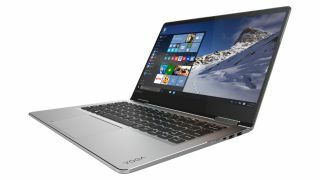 These will be out a month before the Yoga 710, in April, with a lower-end price starting at €479 (around £375, or $599 in the US) for the 14-inch machine, and €699 (around £550, or $699 in the US) for the larger model. This is a heavier hybrid, though, weighing in at 1.75kg and 2.08kg respectively, and offering a 50% improvement on the longevity front according to Lenovo, having a claimed battery life of up to 8.5 hours. You'll get up to Skylake Core i7 processors with optional Radeon discrete graphics (R7 M460 2GB) and also a diamond-cut palm rest. Finally we have Lenovo's Miix 310, a tablet which comes with a detachable keyboard as standard. This starts at €269 (around £210, or $229 in the US) and will be available in June. For your money, you get a 10-inch tablet weighing 580g with 4GB of memory and up to 64GB of storage, with the option of a full HD display. There's also optional 4G LTE to get online on the move, and battery life is claimed at up to 10 hours.